This my friend, is everyone's "best friend", also known as the "summon uncle" in Singapore. I may not know or have his name, but from his unfashionable sunglasses that look like they came off the streets from the night market of Bangkok, that to me already makes him one of a kind. Yesterday, i stopped my car just directly outside the bank to drop off a cheque. That took about 30 seconds (or even less). I came back and as i was about to get into my car, there came him. I was the only car parked outside the bank and being nice, i told him that i was going off. By the way, while i was exiting the bank, he was still on his bike. I expected him to signal to me to go off (like what most of the officers practice), but no. He came off his bike and told me that he had already booked me. I proceeded to see if there was any slip of paper on my windscreen but there wasn't any. I then asked him where was the fine and he started keying in his small portable device stuff before issuing me a slip of paper two minutes later. While he was doing this, the staff working at the bank was looking in shock and disgust by how he could have summoned me while i was right there, directly beside my vehicle. What really annoyed me was the fact that he told me he had issued an offence when he clearly hasn't. And that if i just went into my vehicle and drove off, he wouldn't have gotten a chance to summon me. 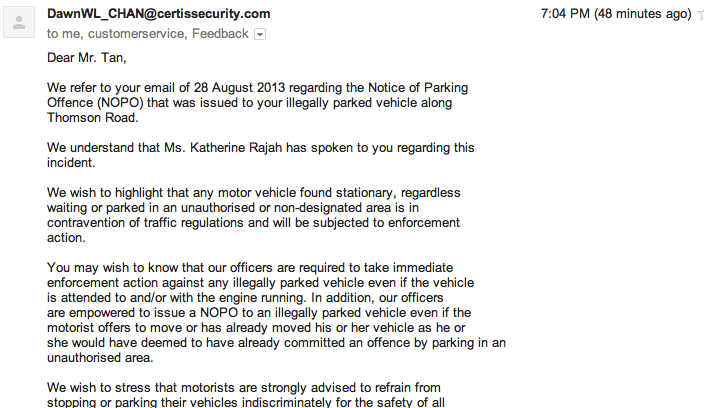 Therefore, it means because of my goodwill to have explained to him, i got a parking offence. The best part was that he told me to "cancel my fine" at LTA after issuing me with a slip of paper, without even signing on it. This is the first time that i have been issued a fine while i am actually standing right beside my vehicle. Even if there was a quota for this officer to hit for the day, i honestly think what he did was ethically very wrong. But of course, issuing me a fine could have potentially saved his rice bowl given the pittance he is earning from his job and he might have a family to feed, so i didn't really blow up the matter. Not until i received an absurd email from Dawn Chan for Vice President Group Marketing and Coperate Communications, Certis Cisco. 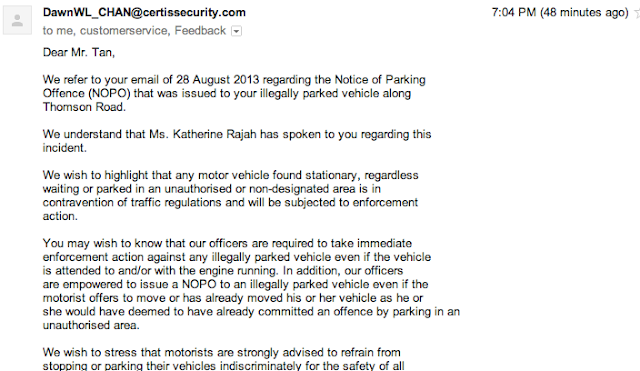 "We wish to highlight that any motor vehicle found stationary, regardless waiting or parked in an unauthorized or non-designaed area is in contravention of traffic regulations and will be subjected to enforcement action"
Am i right to say that if i was waiting for someone in my vehicle, the officer would have issued me a ticket as well? Sad to say, this has not happened before. In fact just last week, i remember that i was in my vehicle waiting for someone while a Certis Cisco LTA officer went past and did not issue me a parking offence. My first question to Dawn " for VP" Chan is WHAT IS YOUR POLICY? If you wish to enforce that any vehicle found stationary waiting or parked is illegal, then you jolly well make sure that all your lowly paid and low intellectual Certis Cisco officers practice the same thing. "However, we were unable to substantiate that claim with the photograph(s) submitted by the officer." Honestly, i would like to see what photographs the officer has taken, and if they have cleverly decided to crop me out in the photo. If their officer is implying that i was not at my vehicle when he issued me the fine, then why is it that i could even describe my conversation with him. Adding on to that, the staff in the bank was overlooking the whole scenario. And if you ask me, i would trust the staff in the bank compared to someone who looks like he went to jail and ended up working at Certis Cisco riding a motorbike going around issuing non-ethical fines. "Separately you may wish to know that contrary to popular belief, our enforcement officers do not have any quota to meet." I initially thought working for a Vice President takes a lot of brains - but i retract my statement now. I guess someone's title or who they are working for does not equate how smart they are. I clearly (looked through my email countless times) did not ask or even mention anything about quota in my email. Did someone that sent an email for a VP just shoot herself in the head? Why did she have to mention quota here when clearly i did not write anything about it in the email to her manager? I suggest the VP gets someone better to send his emails the next time. I wouldn't have written about this whole incident for thousands of people to read (or even show a face of the officer), but only an idiot would buy the story or explanation given. Clearly, there isn't a proper policy put in place because all their officers are practicing different things. And to end this serious post off on a lighter note - does this officer think he is Ninja Turtle? What's with the two strands of cloth sticking out at the back of his head? So the next time you see a Certis Cisco officer, don't just stay in your car, or beside you car - run and accelerate. You never know whether the officer will issue with a fine or not. Anyway, like i mentioned earlier, there is no consistency among their officers - some fine you, some don't. Time to buck up Certis Cisco, at the rate you are doing stuff, don't even talk about security when you can't even get a simple thing like this right. Or perhaps shall i bring it all back to last August when the news reported someone missing valuables from their safe deposit box in August? Which just adds more truth to what i had to say about their officer. 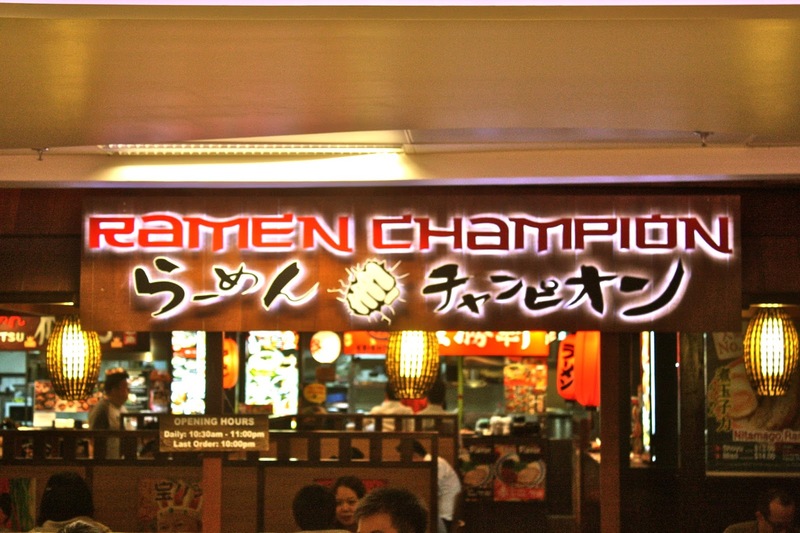 Ramen Champion is a place where you will be able to find not only one, two or three different kinds of ramen. 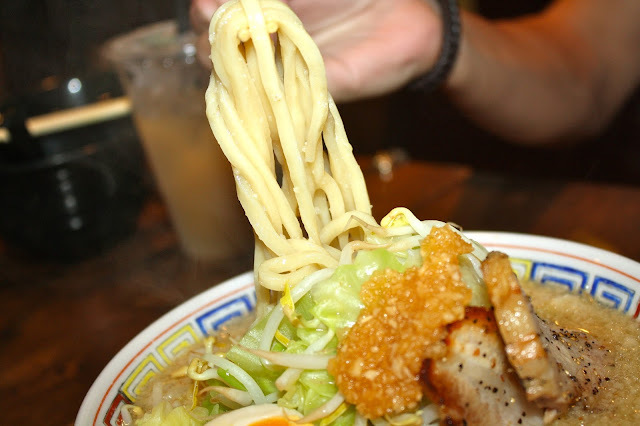 Yes, Japan's most loved noodle dish with a lot of variety, all at one place. 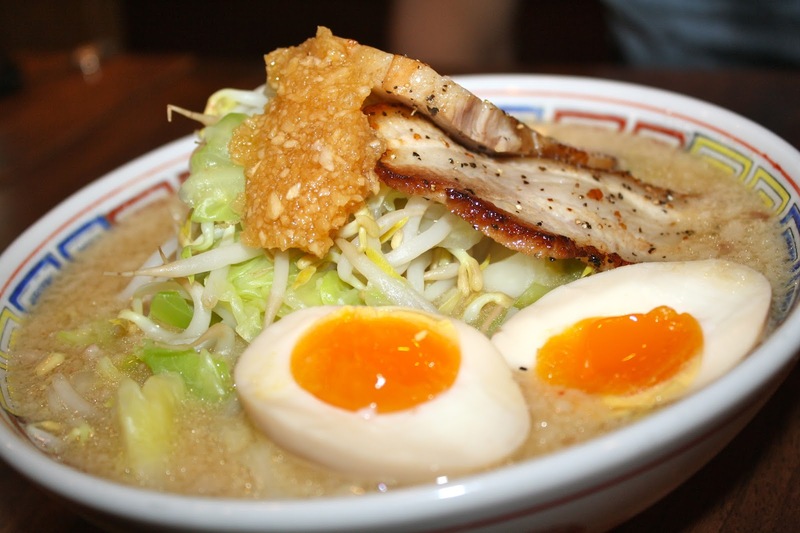 Under one roof, you get to try Japan's best ramen from different places and chefs. And ultimately, the store that sells the most bowls every year cliches the title of Ramen Champion. The first bowl of ramen we tried was the Ajitama Ramen from Keishoken. The soup was rich in flavor and the noodles were cooked nicely. The eggs on the other hand, seemed to be a tad overcooked but it still complimented the soup well. The only turn off was a single piece of meat being served, which seemed a bit pathetic. 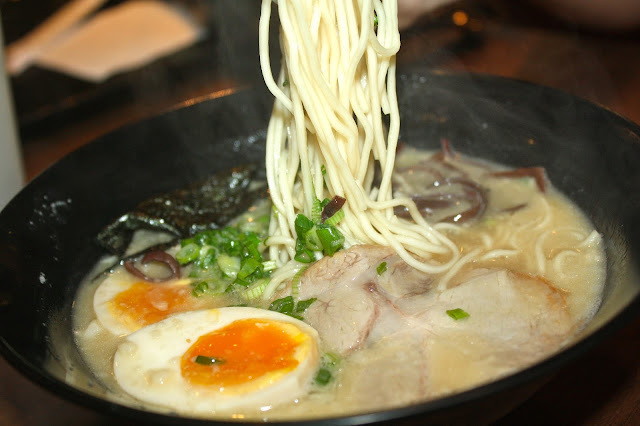 The second bowl was the Nitamago Ramen from Riku. The noodles from this bowl of ramen seemed thicker than your usual. The Nitamago Ramen is available in two different soup bases - shoyu and miso. We had the miso base with a heap load of garlic on top, which gave a soup a different taste when mixed in. There was quite a generous amount of vegetables and pan-friend pork in it. The only downside again was the egg, which i believe was overcooked due to the yolk that didn't seem as runny as i expected it to have been. 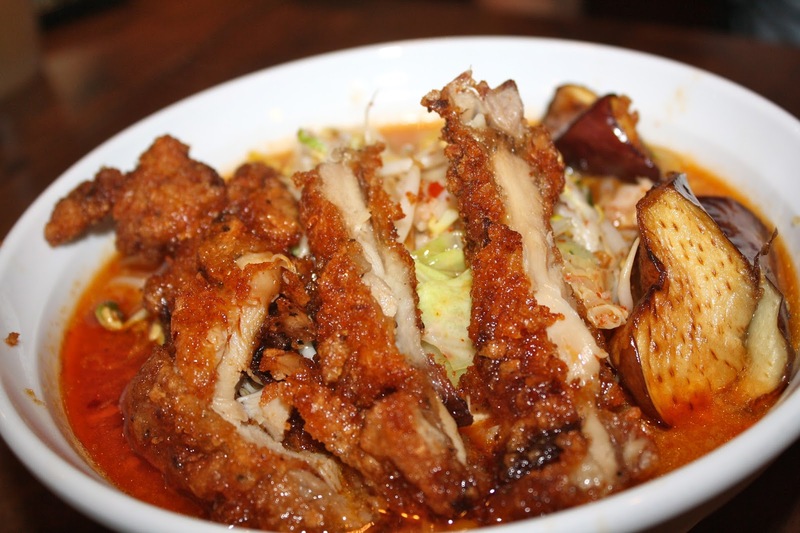 Spicy enough to make you sweat, the Takanotsume Ramen from Riku will leave any chili-addict satisfied. With three different variations (mild, spicy, super spicy), this ramen topped with deep fried pork and eggplant is something very different compared to your miso and shoyu based ramen. 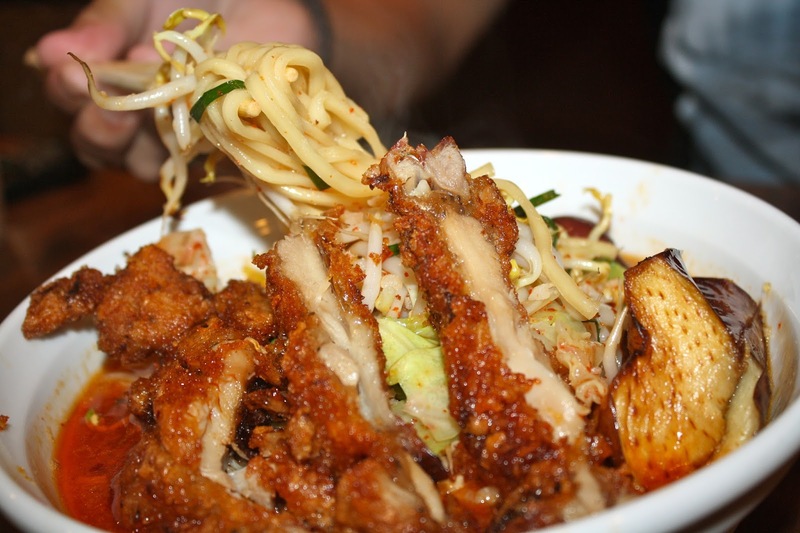 We found the noodles a tad undercooked, but the deep fried pork, as well as the soup, made up for it. The spiciness was good enough to make the partner and me stop at two spoon-fulls, so i suggest going for mild if you are not that good with spicy food. 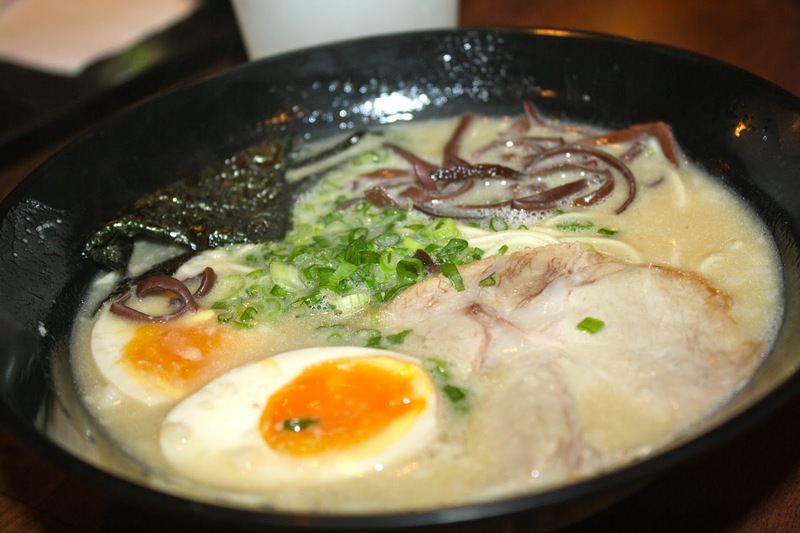 With so many ramen stalls all at one place, you are bound to find something you like (you just have to keep trying). But really, who can ever get sick of ramen? The Black Sheep Cafe should ring a bell for those who know where to find the best duck confit in Singapore. The Black Sheep Cafe made its debut at Seletar, then Mayo Street and now after a hiatus, is back at Thomson V.
The humble 60 seater cafe at Thomson features minimal artistic elements (except for sheep related art works on the wall), which also means there isn't any dress code or sort to dine there. The idea of the cafe is simple and straightforward - good food, comfortable ambience, and at affordable prices. When a chef leaves, the popularity of the restaurant may also leave. Chef Ratha Krishnan, a recognized figure in the local culinary circle, has recently left Masons due to "creative" differences. As we will all know how good food follows where a chef goes, Chef Ratha returns to what he does best at - serving up French cuisine with great finesse. Before the starters could even reach the table, we were served soft, homemade bread. It was served warm, with a crispy outer and soft on the inside. There was a good texture from the nuts and oats, so much so the partner and i shamelessly requested for more. For starters, we had the Baked Brie with Pistachio Crust, served alongside fresh greens tossed in vinaigrette dressing and citrus fruit salsa consisting of orange, grapefruit and pomelo. The baked cheese was molten and flowy, with a crisp golden crust on the outside. The acidity from the fruit salsa accompanied the cheese well and the pistachio nuts gave it good texture. Starting off the mains was the Chicken in Red Wine, also known as Coq au vin in French. The chicken leg was extremely tender and the meat fell off the bone effortlessly. The red wine sauce was flavorful and rich although i would have liked it with a tad more wine. The best part of the dish besides the chicken would have to be the field mushrooms stuffed with meat, which only left me wanting more. One wouldn't want to leave without trying the chef's signature dish - The Duck Confit. Sitting on apple rosti and mango relish on the side, all you need is cut into the duck to understand why it is ranked as one of the best (if not the best) duck confit in Singapore. The meat was tender and flavorful while the skin remains beautifully crisp. We also picked up bits of apple in the rosti which made it unique apart from your ordinary rosti you get elsewhere. The last main was a combination of two mains - Lamb Rack with Olive Crust and Soft Shank in Garlic Glaze, as well as Beef Fillet. They serve the lamb and beef separately on the menu but i figured since the partner didn't take either, i asked if i could have both on a plate (but not in actual portions) just so i could get best of both worlds. To begin with, the lamb rack was cooked medium rare, it was well seasoned and the meat was moist and juicy. The lamb shank on the other hand, was soft and literally fell off the bone. I couldn't quite make up my mind which was my favorite after having tried the beef, which was seared medium and accompanied with creamed spinach. The beef had a hint of truffle which i really liked, and the sauce accompanying it pretty much sealed the deal. Having tried Chef Ratha's souffle, i figured we should have the Crepe in Warm Orange Caramel Sauce for dessert. The crepes were fluffy and the orange sauce had a tinge of bitterness in it. However, when paired with the ice cream (which had vanilla beans in it), the whole thing came together really well - perfect over a cup of tea or coffee. Forget about the pretentious restaurants claiming to be helmed by acclaimed international chefs. You don't need to be French to be able to serve up French food with great finesse. And of course, i wouldn't bat an eyelid at the prices, considering the standard of the food. There is also no GST and service charge, in case you were wondering. Like i mentioned earlier - good food, comfortable ambience, and at affordable prices. And just like all good places, seating is limited (especially during weekends), hence it is better to make a reservation to avoid disappointment. A few months back, i reviewed Hinoki, undoubtedly one of the best Japanese Omakase restaurants in Singapore. Helming the kitchen after the departure of their previous head chef is Santaro Li, a man who has made his name locally with many years of working experience at many established Japanese restaurants in Singapore and Japan. For starters, we had the Salmon Soft Bone which was topped with ebico served on a bed of seaweed. The taste is slightly acquired, because the taste of the salmon bone is rather unusual and lightly zesty in taste. The seaweed (transparent, resembling vermicelli) is tasteless but it adds a lot of texture to the dish with its brilliant crunch. Next we tried set of appetizers: Jellyfish with Top Shell, Salmon in a Shell and Pitan Tofu. Apart from the jellyfish that was a tad too salty for my liking, the salmon topped with cod roe sauce was extremely creamy. The tofu topped with century egg sauce was delectable without an overpowering century egg taste. Moving on to what a Japanese chef does best (if not second best) - Assorted Sashimi. As usual, the sashimi is always fresh at Hinoki. We had an assortment of tuna, swordfish, sweet prawn and yellowtail. My favorite was the yellowtail, and the partner enjoyed the swordfish which was torched and had a smoky taste to it. Really, what more could one ask for? Another dish which i thoroughly enjoyed was the Flounder with Foie Gras. The fish was perfectly moist and seared, wrapped around foie gras served on a sakura leaf. It was topped off with a truffle sauce which was lightly fragrant without overpowering the freshness of the fish. Suprisingly, the leaf tasted like seaweed. For our main, we were served a very unique dish aptly named 'Pumpkin under Snow'. The dish was made out of combination of minced shrimp and pumpkin (from Japan) covered in egg white doused in pureed pumpkin sauce. The egg white was light and fluffy and the sweetness of the pumpkin paired well with the shrimps. After which was a clear refreshing soup with a lot of different ingredients in it. The Oyster and Swordfish Soup which has been steamed has mushroom, leeks, oysters, swordfish and seaweed. The ingredients were very fresh, which made the soup very flavorful but not too heavy. My favorite thing to have at Hinoki is sushi. And still up till date, my favorite is the tuna belly sushi which melts in your mouth, followed by the sea urchin and sea eel, which does not need any dipping sauce at all. And a maki that you wouldn't get anywhere else, the Santaro Maki which consists of mint leaf, tamago, salmon leek and wasabi had a very unique taste. I liked how the fusion of flavors came together as whole with all the ingredients complimenting each other. Ending off the meal was a scoop of Black Sesame Ice Cream which is hand-made. As a black sesame lover, you are bound to like it. Still, Hinoki ranks on the top as one of the places one should go if you want quality Japanese food. As usual, the prices may be a bit steep, but the quality of food justifies the price point. If you happen to not want to opt for Omakase, they also bento sets, which are just as good. And just to add on to all the positive points, the service staff at Hinoki really deserves a thumbs up as well.